I LOVE Cup of Jo and the author Joanna! She has a little boy who is few weeks older than our little Roo... so every time she writes about parenthood, I am totally engaged! 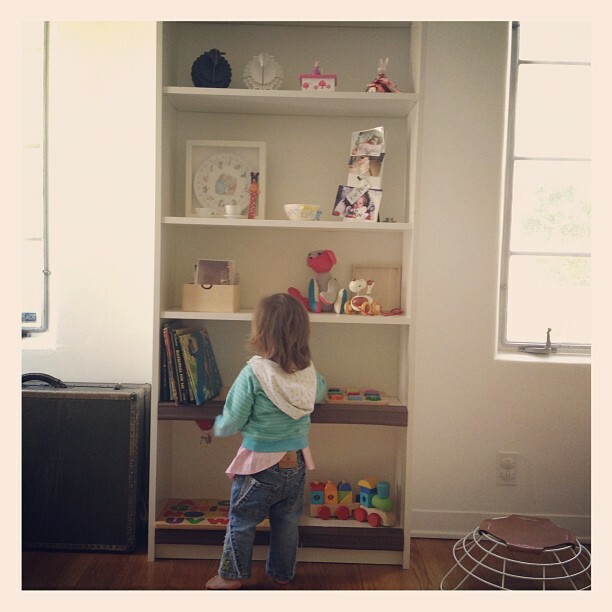 The other day, she wrote about a book called Simplicity Parenting and I had an aha! moment. We have been reducing amount of Roo's toys since we came back from our trip but I liked that I could take it to the next level! We are super strict about what we bring to our living room, bedroom and kitchen... why shouldn't we practice the same rule to Roo's room? So this morning I put away big chunk of her toys in the closet where she can not reach nor see... and only left numbers of toys that felt visually appealing to me. Less books, less cars, less options... = better focus. Today with a very few toys/books around us, Roo spent more time with each book, went through toys that she have not touched for the longest time (and actually enjoyed it) and had moment when we just hang out without needing to feel occupied.